This image shows the Center Block of Parliament Hill from the shores of Ottawa River. The current Centre Block was built between 1916 and 1927 to replace the original building destroyed in a spectacular fire in 1916. It is only one of the magnificent Gothic Revival buildings gracing Parliament Hill, but it is probably the one most quickly recognized by Canadians coast to coast. Home to the Senate, the House of Commons and the Library of Parliament, the Centre Block is an integral part of Canada's heritage, and a symbol of its highly regarded parliamentary system. 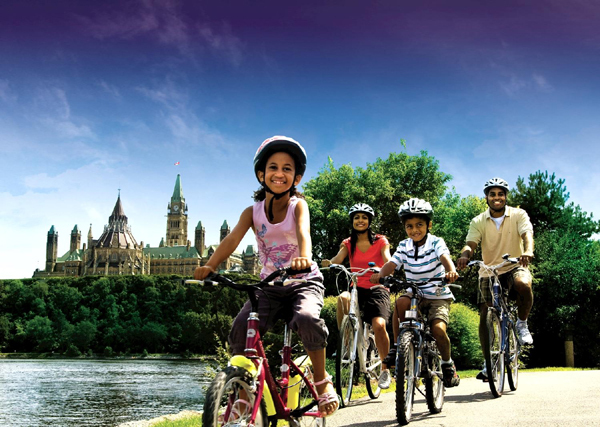 SOURCE: Ottawa Tourism, courtesy of Canadian Tourism Commission. NOTE: The information regarding Canada on this page is re-published from other sources. No claims are made regarding the accuracy of Canada information contained here. All suggestions for corrections of any errors about Canada photos should be addressed to the copyright owner noted below the photo.